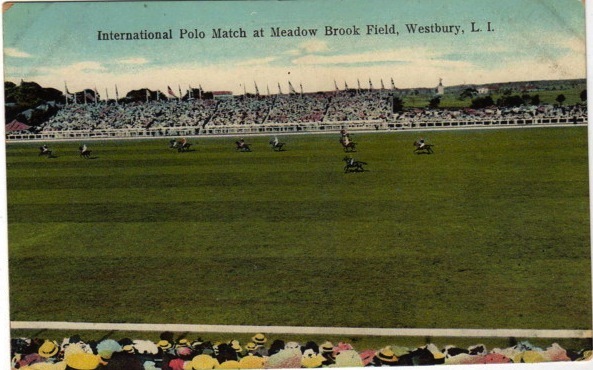 An international polo match sometime during the 1920s at the Meadowbrook Polo Field in Westbury. 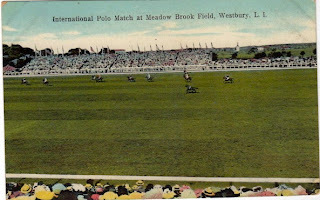 Click HERE and HERE for more on the Meadowbrook Polo Club. This must be the Meadow Brook of the 8 fields. It lists a location of Westbury. Do you know where it was located? Here's a 1927 map with two arrows for you...the one on top is pointing at Old Westbury Gardens and the lower is the Meadowbrook Club. There were many more private fields in the vicinity than I was aware of. Thanks Zach! That is a clear map and there must be enough flat ground there. That book on polo is a great find, but I don't think that even this list of private fields is exhaustive. In the section on Ohio there was no mention of Julius Fleischmann's private field in Indian Hill. I used to take riding lessons there many years ago when it was a disused polo field. Nice photos, one of my friend buy old photos of that polo ground from amazon.